What a month June was for the garden! No rain at all for us here, and a long long hot spell. 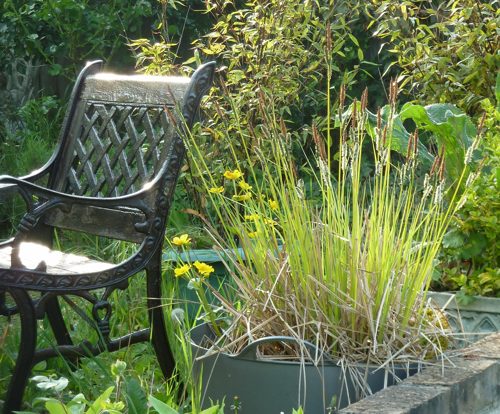 After the very humid heat in May which I find particularly hard to work in the garden in, the last part of June, though much hotter, was at least fresher, and we have struggled on trying to keep pots, cuttings, and vegetables alive. We don’t water the rest of the garden generally, and our soil is like dust. The drought has been so severe even some of the hardy geraniums with their shallower roots are looking droopy. Other plants are flowering but going over quickly – the Jasminum Officinale has flowered and dropped its flowers all in the last four days of June. But the scents in the garden this month from the roses (what a great rose year this has been, very floriferous), the philadelphus, and then the honeysuckles, and then – all too briefly – the Jasmine have been accentuated by the heat and stillness. 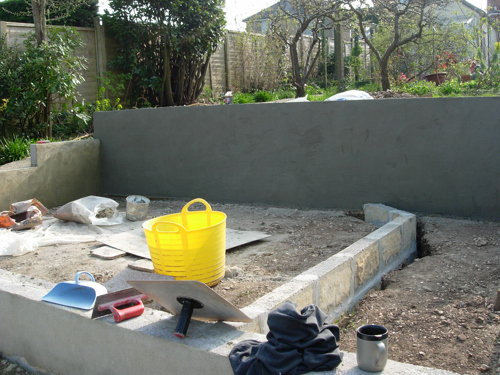 The block wall at the back is the retaining wall for the patio I showed you being constructed in my article about the cowslip meadow. 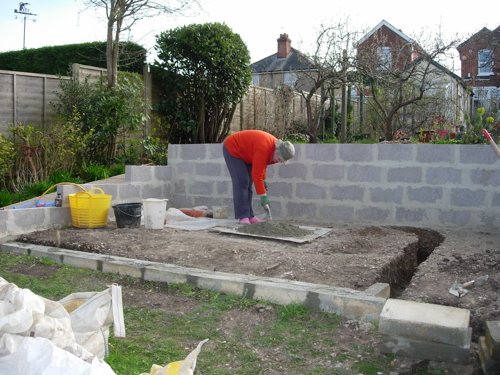 This I hope shows you how much we had to dig out to make this flat surface – the blocks that step down to the left at the back retain the utility path that we remade – also shown in the article about the cowslip meadow. 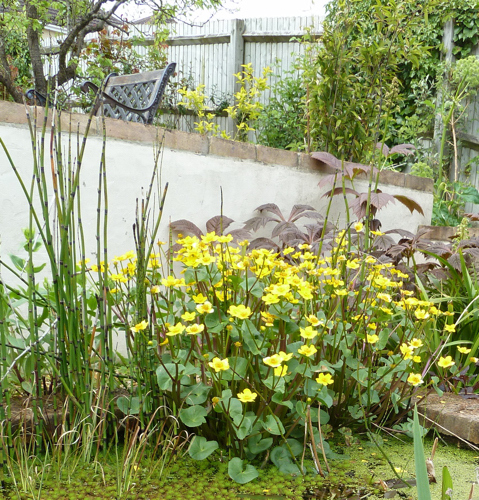 As you can see there is a bog garden marked out on the right, and a double thickness block wall at the front to retain the pond about 60cm out of the ground. 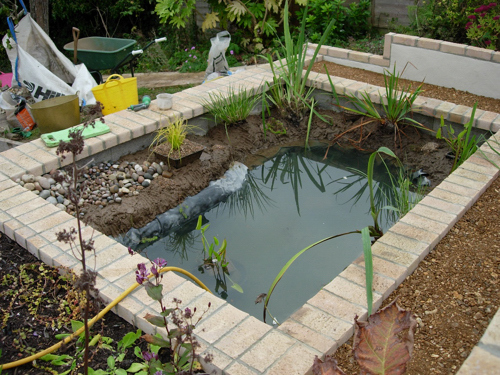 The dots inside the rectangle are to represent the marginal shelf, and there is room for a hoggin path on the left far end of the pond and round the back to where the diagonal marks are which is the edge of the bog garden. 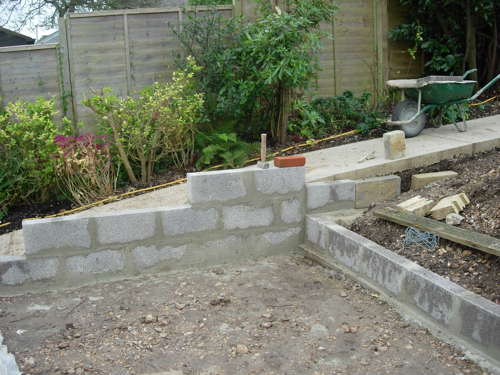 This gives you an idea of how low the side walls were to be, but also how much the patio above had to be built up to make it level. 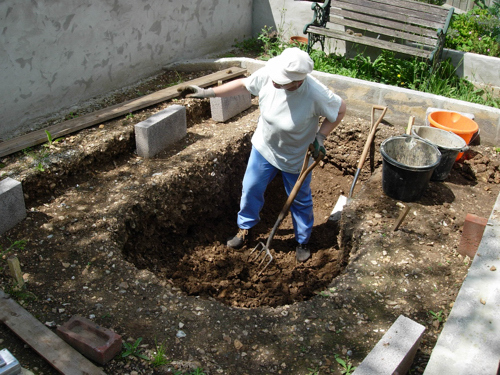 Just as well we had to dig out an enormous hole for the pond! 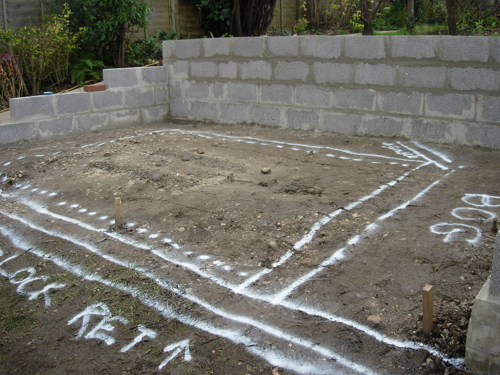 The measurements I have given you are of where the ground is under the pond in relation to the proposed surface of water level, we had to factor in underlay, liner, and soil/pebbles to determine where the planting level for marginal might be. Eg, Equisetum hymale likes to be in a water depth of 0-10cm, so the top of the soil on the marginal shelf needed to be as close to 10cm below the water surface level as possible, but the ground surface under the pond’s marginal shelf had to be dug out to much deeper than that to accommodate the underlay/liner and soil on top of it. What marginal plants did I want? 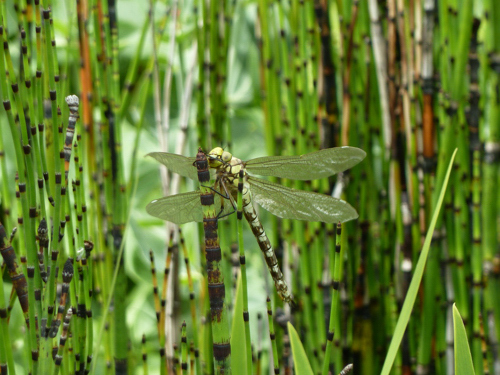 I already had the Equisetum hyemale and the Iris pseudacorus ‘Variegata’ as I mentioned last month, but I wanted to have something of interest in the winter as well as the Equisetum, so I chose Acorus gramineus ‘Variegatus’ (Variegated slender sweet flag), which was such a chunky plant when I got it I was able to divide it and place half just where the beach turned into the lower, narrower marginal shelf, and half directly opposite, with the Equisetum next to it. 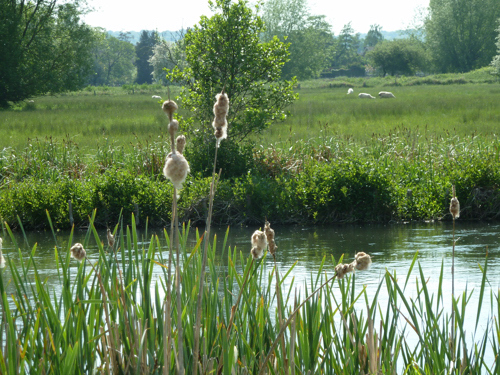 And being well aware they were far too big and invasive for my little domestic pond, on the shallow beach I planted Typha minima, the miniature reedmace. It requires 5-10 cm water above its soil line, and I was assured would not be invasive if you took the 3cm seedheads off before they exploded into a ball of white fluff and spewed seed all round. I can confirm that they were WRONG. 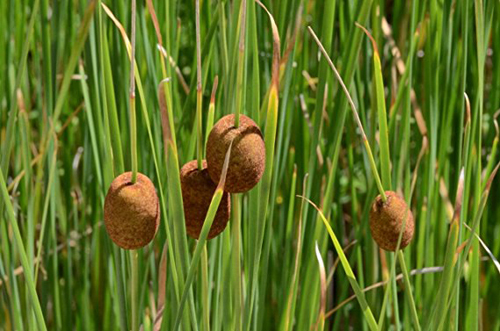 Even taking every single reedmace seedhead off this innocent looking little plant (the leaves were less than 10cm high) it spread, within one year, not just all round the side of the pond it was planted on, but was headed for the other side too. Very thickly growing, like a wall of thin green stems popping up in the middle of the clump of Acorus gramineus ‘Variegata’, and other marginals I mention below, and smothering the Lobelia cardinalis I planted beside it at the edge of the shallow beach by the bog garden. That winter I pulled up every leaf I could see of it. Trying to get its extensive roots out too. To my surprise, I seemed to have succeeded, and it did not reappear. 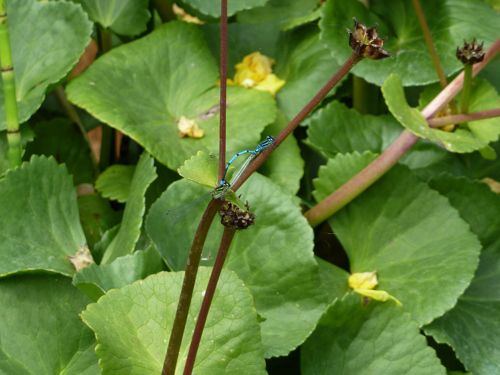 The yellow of the Marsh Marigold would be followed by the variegated spikes of the Iris and then its yellow flowers. 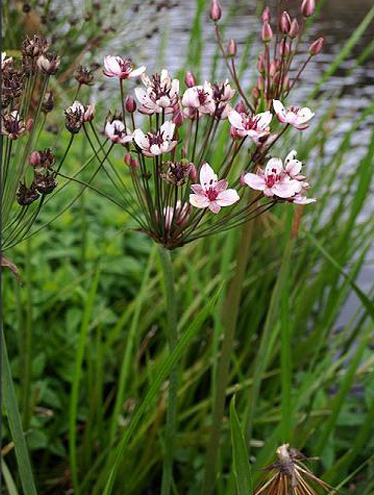 For midsummer colour I had drooled over a beautiful pink plant at the Hampton Court Palace flower shows for several years – Butomus umbellatus, the Flowering Rush. It has the most lovely pale pink flowers in an upturned umbrella formation in July, and I had to have it! 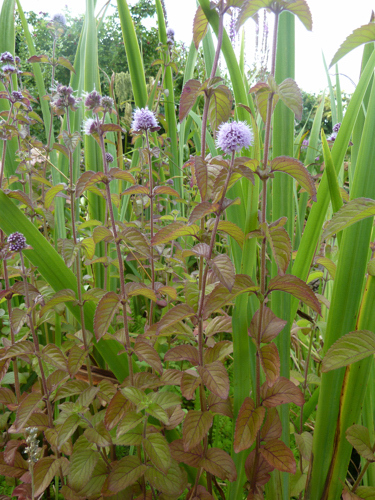 In its place in the pond I put some water mint – Mentha aquatica – also in a pot to try and contain it a little – like any mint, it took no notice of its confines and is spreading across the water, but is good for cooking, and easy to pull out. 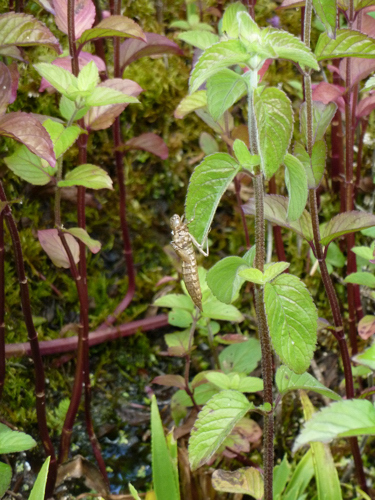 I was particularly taken with this plant as I had seen it at the edge of many natural ponds, and it is very good for wildlife – as you can see from this shot in July 2016 with the exuvia (discarded nymph case) of a dragonfly clinging to a leaf of it – sorry I don’t remember which dragonfly it is, though it could be the Emperor Dragonfly pictured above. To show you how I planted the marginals here I am putting the mud I have mixed on the marginal shelf – this mud was some of the subsoil that we had excavated out of the hole for the pond, mixed with a very small amount of top soil from the hole, sieved twice at least to get all the stones/flints out of it, and then mixed with water. Lovely job for cold October days! Can you see Bowles Golden Sedge sitting on the beach shelf – you may note there is a white material layer on top of the butyl which is some spare underlay I am putting the mud on so that the roots/any small particles I haven’t got out of the soil etc don’t pierce the liner. It goes up behind the blocks that you can see under the capping bricks so they are not rubbing on the liner either. 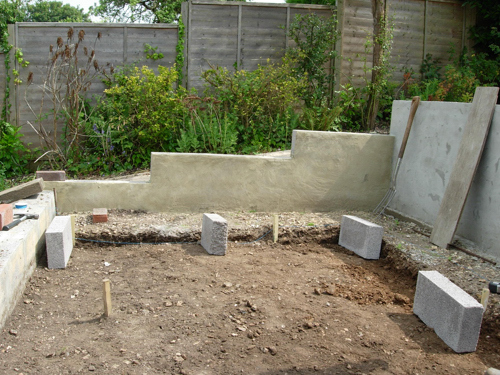 These bricks cap all the retaining walls which you can see have been painted cream. 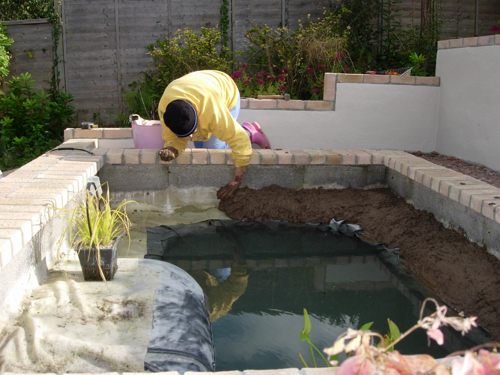 Next time I will talk about completing the pond and the water plants we chose for it. 0 Comments To "On a Chalk Hillside July 2018"